Peach upside down cake. A caramel poured over the peaches before baking melts into and saturates the peaches during baking. There’s really nothing like an absolutely ripe peach. When I bite into one—peeled or not, the taste I get as the juices run into my mouth make me moan with delight. Does this happen to you, too? Peaches are at their peak right now, and instead of just eating all of them fresh or making a pie, cobbler or crumble, I decided on an upside down cake. I knew I didn’t want the cake to have a brown sugar butter topping because that would just about bury the yummy peach taste. While searching for some ideas on the web, I came across a 1988 recipe by Florence Fabricant in The New York Times that looked promising. The recipe said to make caramel syrup and pour it over peaches lining the bottom of a buttered cake pan. Hmmm, I thought. The caramel sets, creating a hard shell, but during baking it melts right into the peaches, saturating them deliciously. I had never seen this method before, so off I ran to the kitchen to test it out. The cake is fantastic. 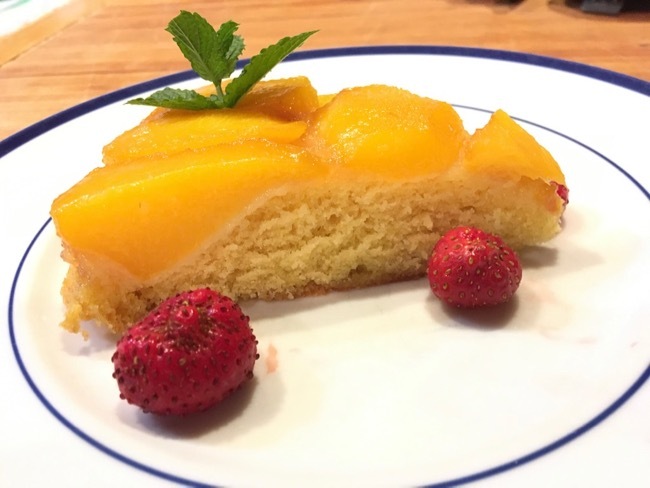 The peaches taste really fresh, and they blend perfectly with the cake’s soft texture. But I had to tweak things a bit. The original recipe calls for 3 eggs, but that caused the unmolded cake to sink in the center as the cake cooled. Two eggs works just fine. But because the batter is quite thick, I stirred in 2 tablespoons milk to lighten it. I find that baked fruit desserts always taste better with just a tad of salt, so I whisked 1/4 teaspoon into the dry ingredients. And because I love what vanilla does for just about anything I bake, I plopped 2 teaspoons into the batter. I now have what I think is the perfect recipe for peach upside down cake. I think the magic ingredient is the caramel syrup. As you’ll see, it’s quick and easy to make. Even if you’ve never made caramel, just follow the directions and you will triumph. And carefully measure the flour. I encourage you to use a kitchen scale. But lacking that, do follow the directions in the recipe headnote. So, get ready, set, bake! 1. Smear some of the 1 tablespoon butter onto the bottom and sides of a 9-inch layer cake pan. Line the pan bottom with a round of parchment and grease the parchment with the remaining butter. Please don’t use cooking spray because you want the butter to melt into the peaches. 2. If your peaches are fully ripe, the skin should peel right off. If you’re not sure, bring a large pot of water to the boil, add the peaches, and wait 20 to 30 seconds. With a slotted spoon, transfer peaches immediately to a large bowl of cold water. When cool enough to handle, set peaches on paper towels to drain. Cut the peaches in half along their seams, slip off their skins, remove pits, and slice each peach half into 5 wedges. Arrange the slices, spoke fashion, or any way you like, in the prepared pan. 3. Adjust an oven rack to the lower middle position and preheat to 350 degrees. 4. For the caramel, put 1/2 cup of the sugar into a small (1-quart) heavy saucepan and add the water. Do not stir. Set the pan over medium heat and leave it alone as the sugar dissolves completely in the water. When the liquid boils, cover the pan and cook 2 full minutes to wash down any sugar crystals on the side of the pan. Uncover the pan and cook for a few minutes more until the syrup turns amber in color. As the syrup bubbles away, it’s okay to swirl the pan gently by its handle occasionally. Watch carefully as the syrup cooks quietly and turns a lovely golden brown. Immediately remove the pan from the heat, and drizzle the hot caramel evenly over the peaches. The peaches will sizzle. Just pour whatever syrup pours out of the pan. Do not scrape out any that sticks to the sides of the pan. And don’t worry that there isn’t enough syrup to cover the peaches completely. 5. To make the cake batter, whisk the flour, salt, baking powder, and nutmeg together in a medium bowl. Beat the 1 stick of butter, the remaining 3/4 cup sugar and the vanilla with an electric mixer on low speed until combined well, about 1 minute. Increase speed to medium high and beat for 4 to 5 minutes more until fluffy and light, stopping to scrape the bowl and beater once. Beat in the eggs one at a time, beating well after each. The batter will look curdled. That’s okay. Scrape the bowl and stir in half the dry ingredients. Stir in the milk, then the remaining dry ingredients. The batter will be thick. Spread it evenly over the peaches. 6. Bake about 40 minutes, until the top of the cake is golden brown, domes slightly, and a toothpick comes out clean. Remove from the oven and set the cake on a hot pad. Run a small sharp knife all around the sides of the cake, set a platter on top of the cake, and invert the two. Carefully lift the pan off the cake. If any peach slices have stuck to the pan, carefully set them back onto the cake. Serve warm or at room temperature. This cake needs no topping. A few raspberries and a sprig of mint gussy up the presentation, but that’s entirely up to you. This dessert is best very fresh. I completely agree about the salt! Years ago I attended an event at the old Gourmet test kitchen. They baked one cake with around 1/4 teaspoon of salt and another with a 1/2 teaspoon of salt — the difference was staggering. The flavors popped in the one with just a tiny bit more salt. I’m very fond of the Plum Torte recipe from the NYTimes. I have made it substituting peaches for the plums and it turns out great. Hi, Amy, and thank you so much for saying that salt and fruit really do belong together. And ditto on the plum torte. As always, happy baking! This sounds absolutely fabulous. Can’t wait to try it. The only challenge is finding ripe fruit to bake with. I remember when we could go to the market and buy perfectly ripe peaches and run home and bake a pie. Those days are gone. Even at the farmer’s markets the fruit is not always fresh. The next time I find ripe peaches, I will bake this cake. Thanks, Greg. Hi, Marlene, and thank you so much for your comment. Peach season is just about over in Montana, but Costco has organic peaches now that are really fine. Do give them a try and let me know what you think.